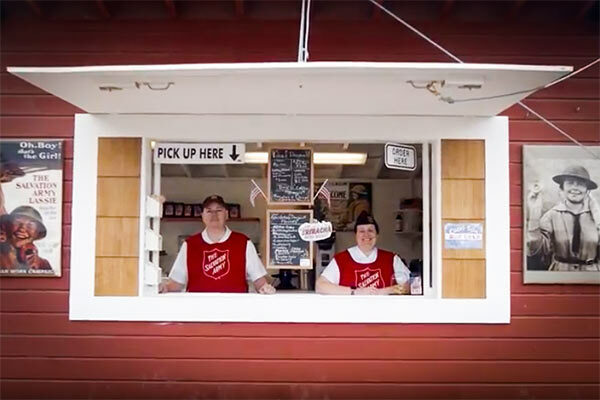 In the remote village of Hoonah, Alaska, The Salvation Army has created a unique approach to raising money: by selling doughnuts. From May to September, cruise ships of all sizes stop at the port in Hoonah, and the hungry tourists coming off the ship discover The Salvation Army’s small doughnut shack, where they purchase the delicious & fresh mini-doughnuts in droves. “Hoonah is on an island and as an island there is two ways to get here: fly or float. It’s a beautiful place to live. We see whales in our front yard dear and bear in our backyard. A population of 750 to 800 people year-round. Subsistence is a lifestyle here. We live off the land as much as possible. We’re actually in deer hunting season, so that’s what a lot of us live off of throughout the year. Then there’s fishing; we’ve got salmon, halibut, crab, shrimp, sea asparagus and seaweed. But there’s still things you gotta buy. There’s still dry goods you gotta bring in. So you gotta have money to buy that. Icy Strait Point is a stop for the cruise ships. It’s owned basically by the people of Hoonah and they’ve done a very good job. So basically, we are a tourism-based society so we have from May 1 to September 30; that’s when they make the money. When we first moved here, we went down to Icy Straight Point and there was an empty hut, and I looked into the window, and I saw all this doughnut equipment and I just thought it’d be kind of neat to do something like that. Baking has been a big thing for me. I love the science behind it. I love The magic behind it. Doughnuts were synonymous with the donut girls in The Salvation Army in World War I, so we bought it. And well, I had to learn how to make doughnuts! I just started experimenting. Some of the flavors instantly where hits. Some of them were accidents. Our Sriracha started as a prank. One of the guys wanted to prank his boss with a hot spicy doughnut, so I took the challenge on. It ended up being a very good flavor. Alright, so this machine can do up to 12 hundred mini donuts an hour. The batter goes in here. It makes a river of hot oil, so you can speed the flippers up to make sure that these get cooked all the way on both sides. “About once a week I have to make new flavors. Cinnamon sugar, powdered sugar, chocolate maple, blueberry, apple cider, butterscotch, raspberry, birthday cake, huckleberry, pumpkin spice. “We have our food box program, it’s usually about three to five days-worth of food and we go and deliver it to them because most people in the community don’t have vehicles, so we go to them. “The donut hut helps make what we do here realistic. The monies raised are incredible. Subscribe to receive more stories, directly in your inbox!